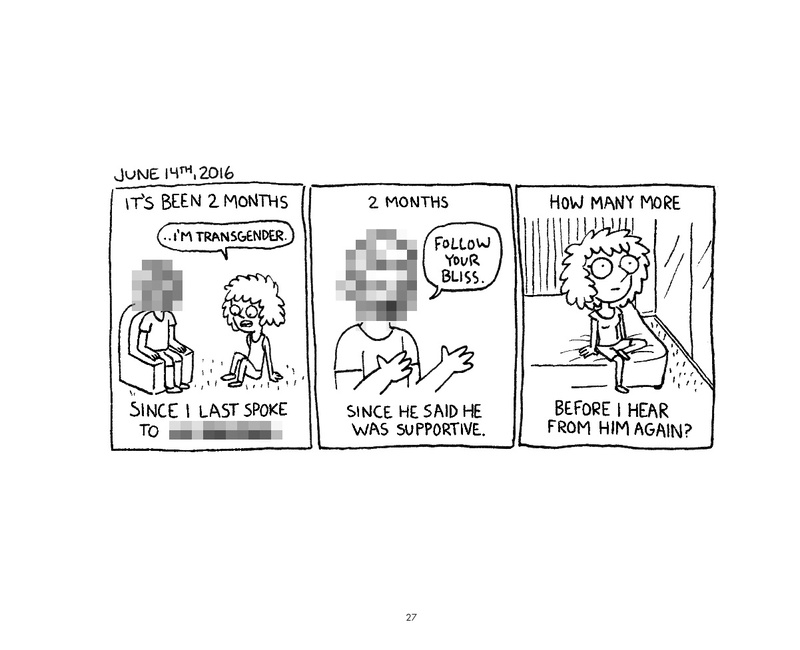 Julia Kaye had been making comics for years – and making the webcomic Up and Out for years – before she transitioned. What had been a humor strip made in full color then became something else as Kaye used the strip to document her own life and trying to adjust to life as a woman. 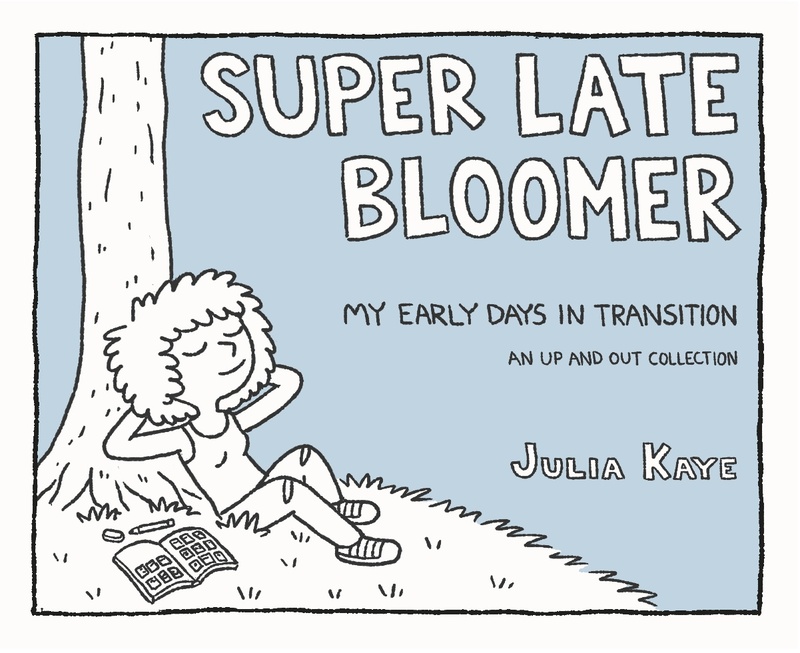 Her first book is Super Late Bloomer: My Early Days in Transition. 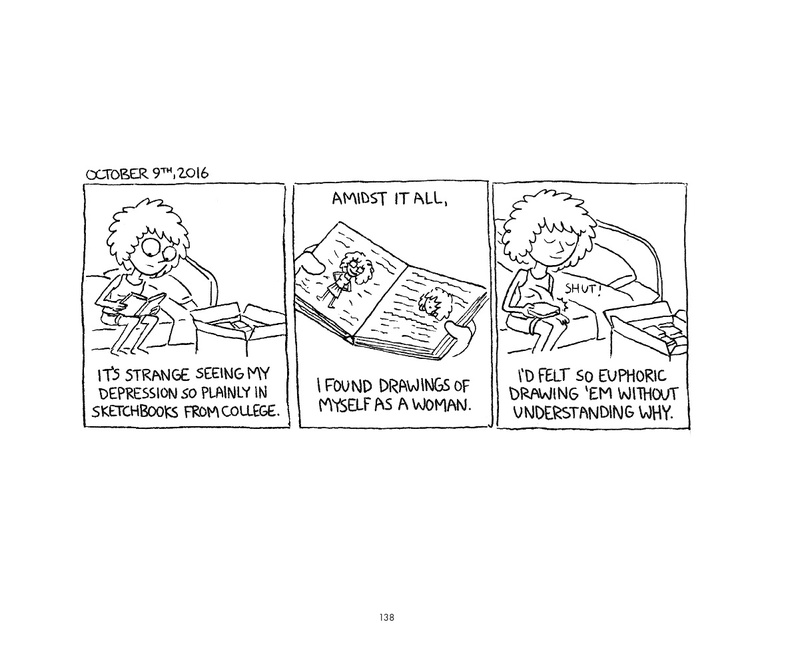 The book collects six months of strips from 2016. 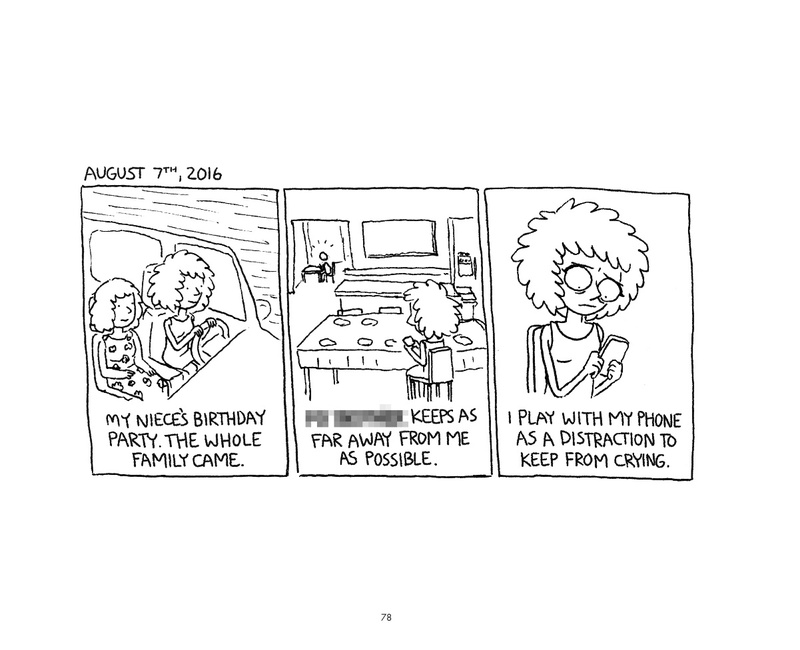 They range from funny to absurd to heartbreaking as Kaye captures her changing life three panels at a time. Kaye is currently working at Disney Animation and continues to draw Up and Out. With Super Late Bloomer out this week, we sat down to talk about the book, her work and how it’s changed over the years. Growing up I always had a love of newspaper strips and later as a teen, webcomics. After graduating college with a degree in illustration, I naturally started gravitating toward making comics of my own, spending my time teaching myself how to draw comics instead working on an illustration portfolio. Over the next few years I kept making comics while working various day-jobs, eventually taking a leap of faith to try doing it full time. That’s when I started Up and Out. For people who don’t know or haven’t read it, what is Up and Out? I’m not sure I know anymore! Up and Out has really changed over time, what started out as an absurdist humor strip shifted to a gender transition-focused autobio series to now a queer romance-focused autobio series. Who knows where it’ll be in a few years! Tell me about Super Late Bloomer. 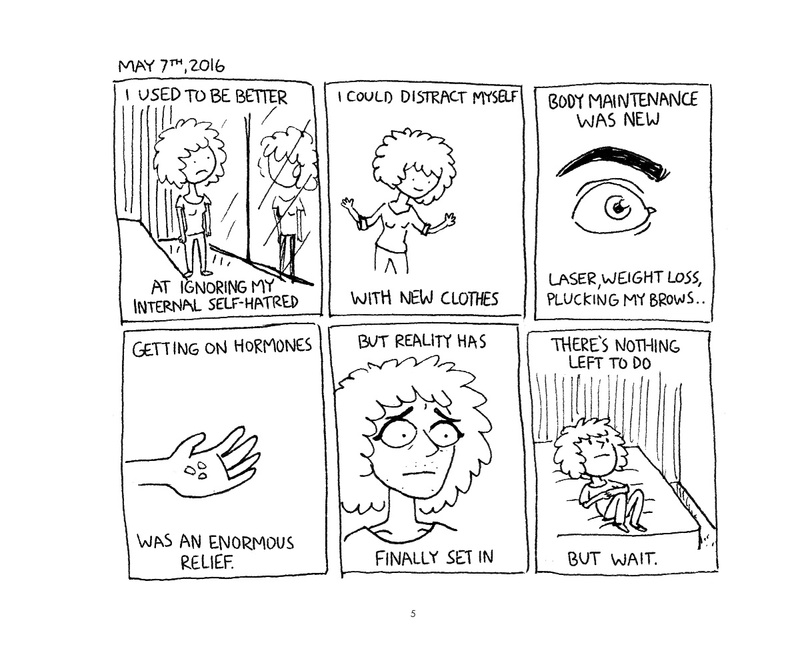 It’s a six-month collection of short autobiographical comics about my experience going through the early days of my transition. They’re a very personal and honest day-to-day portrayal of what it’s like to navigate the complexities of gender dysphoria and exist as a trans person in this society. You were making comics before you transitioned. At what point did you know or feel like you had to make comics about the experience? 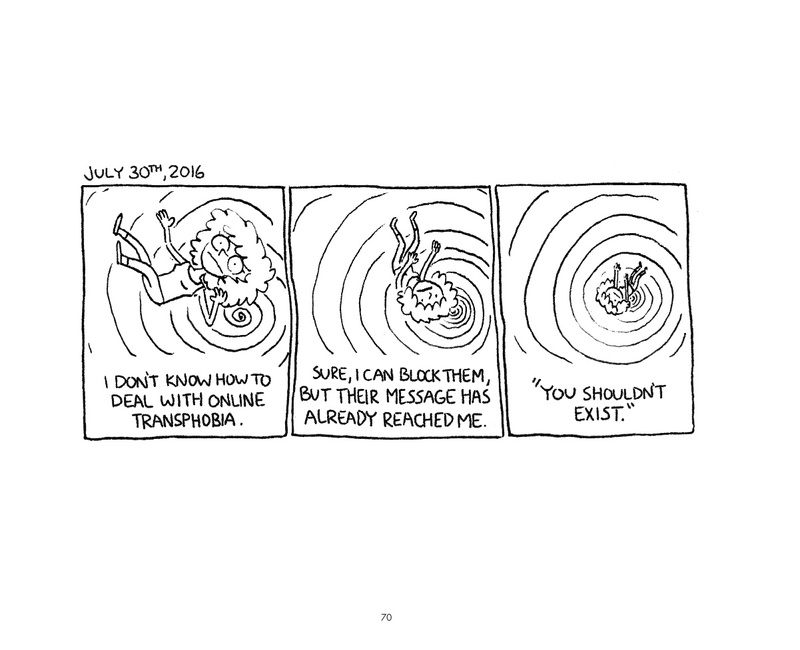 Behind the scenes in early 2016, while I was busy making gag strips for the internet, I was dealing with a lot of emotional turmoil as a closeted trans woman. My life felt like a constant struggle as I wrestled with my gender dysphoria and went through what felt like endless new and scary experiences. It was such a vulnerable period of self-discovery and without having any trans friends in my life who I could directly relate my experiences to, I felt incredibly isolated. So when some cartoonist friends (who I was out to) pushed me to start making journal comics about my experiences to help process everything, I really latched onto the idea. It became a nightly ritual for me to break away from the distractions of technology, take take out a physical sketchbook, and reflect on my day. It was such a breath of fresh air to make comics just for myself, feeling free to fully express myself without the judgment of an audience to worry about. I kept journaling until I’d reached a point where it felt like I didn’t need it as much any more. The book covers six months, May through October, in 2016, and I’m curious how the comics read to you now? It’s surreal to look back on that time now. I know I made them and it was my lived experience, but in some ways it feels like another lifetime lived by someone else. I’ve grown so much since then- my relation to womanhood and dysphoria feel very different now. I’m glad I documented such a vulnerable time in my life so thoroughly because I’d have forgotten most of it otherwise. Do you think that transitioning changed you as a cartoonist? Or forced you to rethink how you work and how you thought about the work? I wouldn’t say transitioning changed me as a cartoonist, maybe it’s changed the way some of my work is received by my audience, but the biggest factor of change was posting strips from what eventually became Super Late Bloomer online. Countless trans people have responded so passionately to the series, it’s been absolutely overwhelming. It quickly made me understand how there is still such a lack of good, nuanced trans representation in media as a whole. Positive queer representation is currently what I most care about when creating art now. Media of all kinds plays such a large role in our society and it’s absolutely crucial for people to be able to see themselves out there. What I meant wasn’t that your style changed, but what you were interested in drawing, and what you wanted from it seems to have changed. Yeah, definitely. As I progressed further into my transition and had time to reflect on the general lack of available media representation for trans and queer people, it became increasingly important to me to add my perspective into the mix, however possible. It’s not enough for me to just create absurdist strips in a vacuum any more- I can do it, but I really don’t feel the pull to make them the way I used to. Clear, nuanced reflections of my life as a queer woman is at the forefront of my mind when making personal art. I started out as an all-digital artist working on a tablet, but moved to pen and paper when I started making Super Late Bloomer. As I mentioned earlier, I found it to be a great way to block out digital distractions, and just focus on making a comic. Also, I now work in animation, drawing on a tablet all day, so it’s nice to just not stare into a glowing screen for awhile. You make these personal comics without color and just line drawings. You want this very raw, very simple approach and I wonder if you could talk a little about why you like this style. To be honest, it mostly had to do with speed of creation. When I started making autobio strips, I was already feeling pretty maxed out creating 4 color gag strips each week, I didn’t have time or energy for anything more than quick 3 panel black and white comics! If I didn’t put those constraints on myself, I would’ve quickly become overburdened and probably would’ve stopped making the series after the first few days from burnout. Nowadays I enjoy that it’s reminiscent of the newspaper strips I grew up reading so I’ve kept it up. You’re also working in animation. What are you doing? I work for Disney TV Animation on the show Big City Greens (out later this year!) as a Storyboard Revisionist. I help draw characters on-model, adjust and add necessary character acting, and really anything else that needs doing to get a storyboarded episode ready to be shipped out to the animation studios. Are you doing any shows or events this summer? The list of shows is slowly growing, but I’m currently scheduled to be at VanCaf in Vancouver in May, ALA in New Orleans in June, and FlameCon in August.